Batman: A Visual History follows the DC Comics Super Hero from his 1939 beginnings as a crime-fighting vigilante to his present status as a worldwide cultural icon approaching his 75th anniversary. The book celebrates Batman's greatest stories and the writers and artists that created them. It also charts the careers of the Super Heroes and super-villains � Robin, the Justice League, the Joker, Catwoman � associated with Gotham City's Dark Knight. The debuts of every key Batman character are featured, as well as some details of Batman movie and TV series, both live-action and animated. 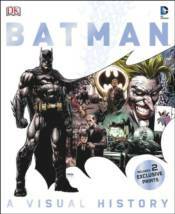 Perfect for any comic book fan, this visually stunning, definitive guide arrives in a slipcase featuring specially commissioned artwork by a top DC Comics artist plus two original prints.